AERZEN offers smart solutions that increase transparency, plant safety and efficiency for every application,regardless of the industry. Transfer, analyse and monitor data worldwide. 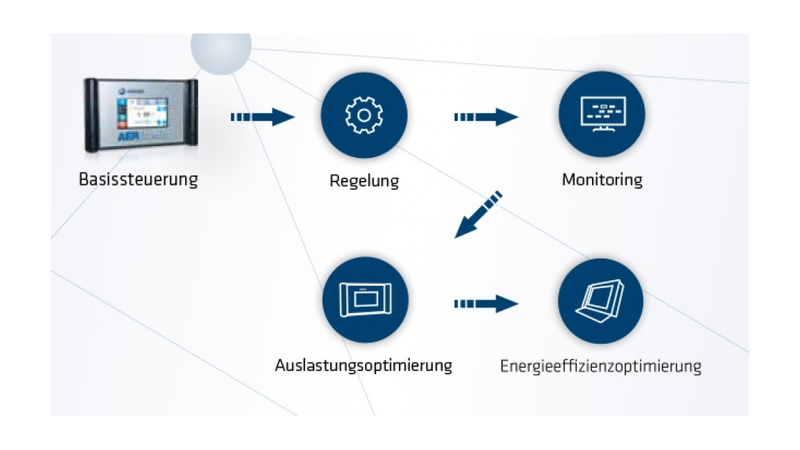 To ensure full and future-proof transparency for the management of your machinery, AERZEN provides a central control tool that offers a special strategic advantage. The need for process reliability, predictive maintenance and anomaly detection are decisive factors for integrating AERZEN control components into your process air supply. Control component. Integrated Industry in a few words. AERtronic Master: The AERtronic Master makes it possible to improve the overall plant efficiency and to utilise individual machines in a more homogeneous way. AERsmart: The master machine control system, the AERsmart, ensures high system efficiency. Webview: A single module that has it all: WebView gives you that decisive plus when it comes to plant transparency. Webview visualises, analyses and stores up-to-date process data. Profinet®: AERZEN Profinet® allows you to establish a simple and bidirectional connection to your control room.